This is a staple in our home, a soup my mother-in-law Luisa makes often during the winter in large batches. This recipe has been in her family for at least 100 years! She told me she remembers when her grandmother used to make it for her when she was growing up. Her grandmother had gotten the recipe passed down from her mother who in turn had gotten it from hers! As with all passed down recipes, she didn't have it written down and every time makes it by estimating quantities. I asked her more or less to estimate how much of each ingredient and then made it myself. It came out very good, and here you can see some pictures we took as we prepared it a few days ago! 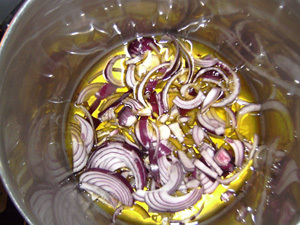 In a large pot, add enough extravirgin olive oil to cover the bottom, add onion and saut� until tender. 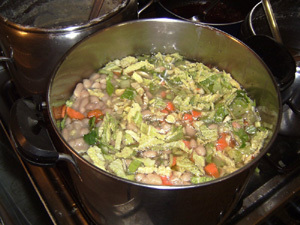 Add cannellini beans and the celery, carrots, cabbage, leek, garlic and vegetable buillon cubes. Add enough water to cover all of the ingredients and a bit more. It shouldn't be too watery. Simmer uncovered on low heat for about 45 minutes or until the vegetables are tender. Add some hot water while it cooks if it seems to be getting too dense. 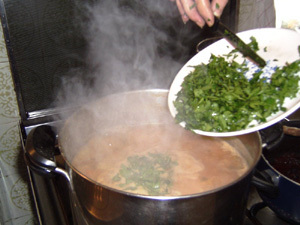 Add the parsley and simmer for another 10 minutes. Taste the soup and add salt if needed. Add the basil and remove from heat. The soup is ready to be served! Variations: The quantities of the vegetables and beans can be changed to your preferences. If you add more beans, it will be more dense and flavorful. You can add more vegetables to make it lighter. It is good all by itself or with some toasted bread dipped into the soup. With farro: Once the soup is cooked, add the farro and more water. The cooking time will vary depending on what farro you have used. Follow the time indications on the package, although generally it takes 30-40 minutes for the farro to be cooked. The soup will become more dense, a hearty soup great for winter! 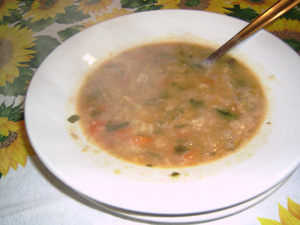 I recommend you try this soup with and without farro, and see which one you prefer.